Kunafin is a family company that started in 1959 and they are based in Texas. Kunafin provides fly parasites to a wide variety of operations ranging from dairies to poultry operations. Five years ago Sherwood Elevator teamed up with the staff at Kunafin to become a dealer in Wisconsin. We offer the ability to determine a fly management plan and purchase the fly parasites through us. 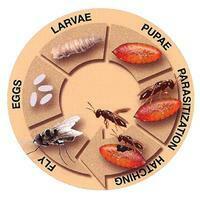 Fly parasites disrupt the fly life cycle by seeking out fly pupae and actually laying their own eggs inside. The parasites larvae consume the pest fly's larvae and hatch from the fly pupae. They then repeat the process on another fly pupae. They work on several species of flies commonly associated with animals. Most importantly, they do NOT harm humans or animals. The fly parasites are delievered directly to you through the mail, usually on a weekly basis. It is reccomended to spread the parasites in any fly breeding areas, most commonly in calf pens or hutches, bedding packs, manure piles, and spolied feed areas. You will want to start using the parasites in the spring before the flies show up and can discontinue once the cooler weather of fall arrives. The Kunafin fly parasites will kill roughly 85% of the flies on the farm. What most people don't realize is that a vast majority of the flies on the farm are yet to be hatched. The adult flies that we see only make up about 15% of the total flies on the farm. The parasites work their way down into the bedding and maure to search out the unhatched flies and kill them before they hatch. By doing so it drastically reduces the amount of harmful chemicals and poisons needed to kill adult flies. You will see a visible difference in the amount of flies. The Kunafin program is very economical and works to eliminate the fly problem before it starts. 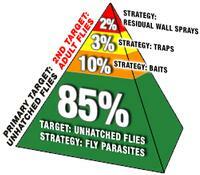 Please contact us today to discuss a fly management program that will fit your operation.